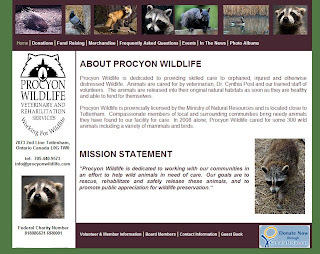 MY COMMUNITY: Procyon Wildlife Web Site Is Live! If you've been following along for a while now, you may remember that I decided to do some volunteering in my area eariler this year. The original post can be found by clicking here. I didn't get out to the facility as much as I had hoped this past year. Boy did the time fly by. Hopefully next season I'll be able to get out and take more photographs for them. What I was able to do, though, was work on their web site. There's still content to be added, but most of that will be done over time. Cynthia and the Board are coming up with all kinds of new programs and exciting things for 2010. I can't wait to see them unfold. So here's a screen shot of the main page of the site. Procyon is always looking for volunteers and donations, especially when the busy season starts up again in the Spring of 2010. CLIENT SHOOTS: It's not only the girls who are cute! To celebrate my 1st Anniversary, the prints and canvas items in the Sunrises & Sunsets gallery have been reduced up to 25%. These prices will be available until December 13, 2009 and then they will go back to their regular price. But she wasn't the only one who grew up this past year. I can't wait to see which one they decide to use for the Christmas Cards. So today is Friday the 13th. Unlucky? Just a regular day? Maybe both, depending on who you are and if you're supersticious. For me, it represents a milestone. Although I've been doing photography work more seriously for a few years now, it was November 13, 2008 that I officially started 'Picture Your Life Photography' and registered my business after probably about 6 months of trying to come up with a name. What a year it's been. The part I'm most amazed about is how quickly it has gone by. There are so many things I've done, yet my white board is full of projects that I have on the go that I have to complete before Christmas. The most exciting thing for this first year has been developing the business and defining what 'Picture Your Life Photography' is all about, as well as developing my own preferences and style. There are so many photographers who inspire me in one way or another, and the world of Photography will continually be a learning ground for me. Having said that, though, I was actually pleased (and maybe a bit surprised) on a few occassions where I was actually inspired by my own work and the progress that I did make in the past 12 months (well....really in the past few years, but the progress was more aggressive in the past 12 months). And it's that, along with clients who are happy when they see themselves in a photograph that I've taken for them, that make me sure that I'm heading down the right road. My Uncle Pete, who passed away this past September, and my Aunt Phyllis were often my reality check and helped scrutinize my business plan as I was developing it, to help ensure that I always consider all of the key areas. My awesome critics and providers of feedback, whether I asked for it or not (just kidding!! haha), Jane C, Al McP., Chris B, are always there to provide me with a different perspective than I might have. My patient friends Aimee, Debbie & Renee, who agreed to be guinea pigs for me as I tried out new lighting, photography and post processing techniques, as well as my family guinea pigs Matt & Robyn who helped me try out new locations. I promise I haven't forgotten about the proofs I still haven't finished editing for you and I'm still plugging away at them. My online Photographer friend Sheba, from Denver, whom I've never yet had the opportunity to meet in person, provided me with more guidance and inspiration than she probably realizes, as I've watched her travel down a very similar road to the one I'm taking. And there are tons of my family members and friends who have helped in each of the above areas who I also can't thank enough. :)) They have all been very patient as so many of my personal photography has had to take a back burner this year. But I hope to catch up with things in the next few months. So thank you for reading this and all of the other posts you read and comment on, both here and on my facebook business page. I hope to be able to see more of you through the lens in 2010 (I'm all booked up for 2009 now...). I can't wait to work on all of the new projects I have planned for year 2!! 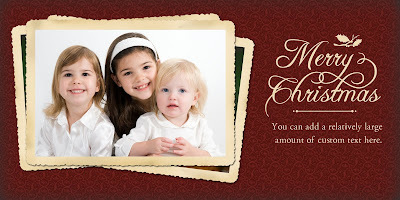 This year they are getting Christmas cards again with the 3 girls. My photo of the week isn't of the girls though. It's a shot I took that actually wasn't really part of the photo session. It was taken before we got started. I thought I had already posted my Photo of the Week, but this morning I realized I'm behind! So for week #18 I didn't take very many pictures. The ones I did take were Halloween related and most had to do with pumpkin carving. I think most of you have seen this one already, but now it's my Photo of the Week. Two weekends ago I had the opportunity to accompany a colleague of mine to an 'Aussie Bounce' in Stevensville, Ontario. Jane Steeves is the Rescue Representative for the Southern Ontario branch of Aussie Rescue and Placement Helpline, Inc. She organized the 'Bounce', which is basically a get together for the dogs where they can run around and blow off some energy with other dogs. A special thank you to Sally and Allan who hosted the event at their property. What a fun day! :) I grew up on a farm and we had usually 2-3 dogs at any given time. It was nice to be around so many of them. There were about 21 or so dogs and they seemed to be VERY excited to be outside in such a large space where they could run and run and run and run. I tried to get a picture of every dog there, but I think I missed some :( They move so quickly it was hard to tell who I might have missed at that time! This cute one is Carly. She is about 6 months old and has severe cataracts, requiring surgery. Currently, she is in a foster home. The Aussie Rescue and Placement Helpline will be doing fundraising to help pay for her surgery. If you click on any of the pictures you'll go to the blog photo gallery that is hosting these ones. There are a couple more there that I didn't post in this entry. For the people who participated in the bounce I posted about 100 photos from that day. Thank you for the opportunity to photograph your beautiful dogs. You will be contacted by e-mail soon with a link to your gallery. Also, stay tuned for a little project I'll be working on to hopefully help raise some money for Carly's surgery. Thanks for looking and to learn more about the Southern Ontario Aussie Rescue group, visit their web site. If you are interested in purchasing dog prints, you can find some here and a portion of the proceeds will be donated towards Carly's eye surgery.